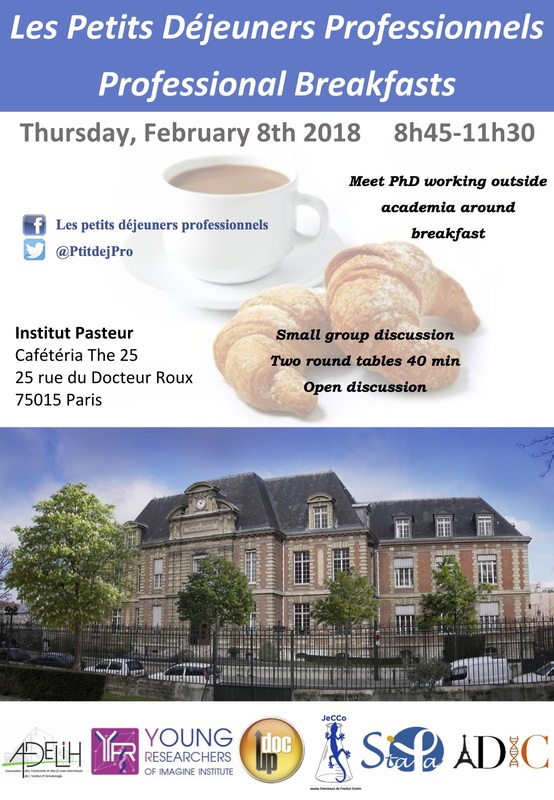 Every two months, the following associations: YR2I, ADIC, JeCCO, Stapa, ADELIH, BioDocs and Doc’Up, invite you to the Professionnal Breakfasts where you can meet people who left academia after their PhD: clinical research associates (attachés de recherche clinique), consultants, scientific communcation, journalism… The morning is divided in two parts, first two round tables, followed by a free time in order to discover more precisely the experience of each guest and discover new career opportunities after your PhD. Céline Curis is project manager at the Fondation Bettencourt-Schueller, where she is in charge of scientific philanthropy. She joined the Fondation Bettencourt-Schueller directly after completing her PhD in Virology at the Pasteur Institute. 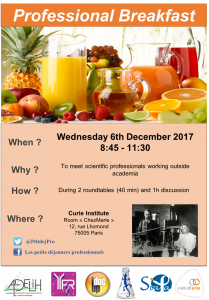 During her PhD, Céline also worked as a scientific mediator for Universcience. Céline Giustranti is communication manager at Imagine Institute. After a PhD in molecular and cellular biology at Descartes university, she was communication manager at Curie Institute for scientific and medical information, and then as external communication manager. She is now working at Imagine institute to increase institute’s visibility. Yoann Arthaud is expert in innovation at Alten. After his PhD in medical devices, he was a post-doc fellow at CEA. Then, he used to work at ministry of Foreign Office in charge of scientific mission before working in consulting at Leyton. He is now working since a few time as expert in innovation in the field of health and pharmacology. Sébastien Paque is project engineer at the French Ministry of Agriculture. He completed a PhD in Vegetal Biology at the CNRS / Université Paris Sud, and then moved to the Wageningen University in the Netherlands where he worked as a Post-Doc. He recently joined the Directorate for Food, where he works of crop protection. Abla Benleulmi-Chaachoua is a business development manager at Inserm Transfert. She did a PhD and a post-doc fellow in cellular pharmacology in collaboration with Servier company. Then, she used to work as key account manager at LaboGene ApS and she is now working at Inserm Transfert to promote academic projects in private companies. 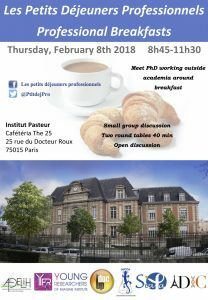 Guillaume Rodriguez: Guillaume defended his PhD in Computational Neuroscience in 2016 and then obtained a position as a Scientific Mediator at the City of Sciences and Industry where he had, during his PhD, carried out a doctoral mission for two years. He participates in the design and animation of science workshops for school groups and the general public. Aude Nyadanu: After studying at the engineering school Ecole Polytechnique, Aude did a PhD in Chemistry at Ecole Normal Superieure in Paris. 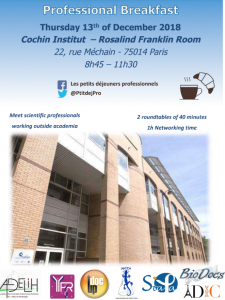 She has just defended her PhD a few months ago and she is now a teacher at University of Paris-Est Marne-la-vallée. She is a member of the board of the French Institute for the patient’s experience. On this optic, she is the founder & CEO of Lowpital. This company is aimed to innovate collectively to improve the everyday life at the hospital for the patients and the health workers. Thomas Landrain: Thomas first did a career in academia after graduating in Genetics from Ecole Normale Superieure in Paris and co-founded the first french synthetic biology lab at Genopole where he did his PhD. He is also the co-founder of PILI Bio, a start up that he directed during two years, which created the first renewable and safe inks to be biologically synthesised by bacteria. 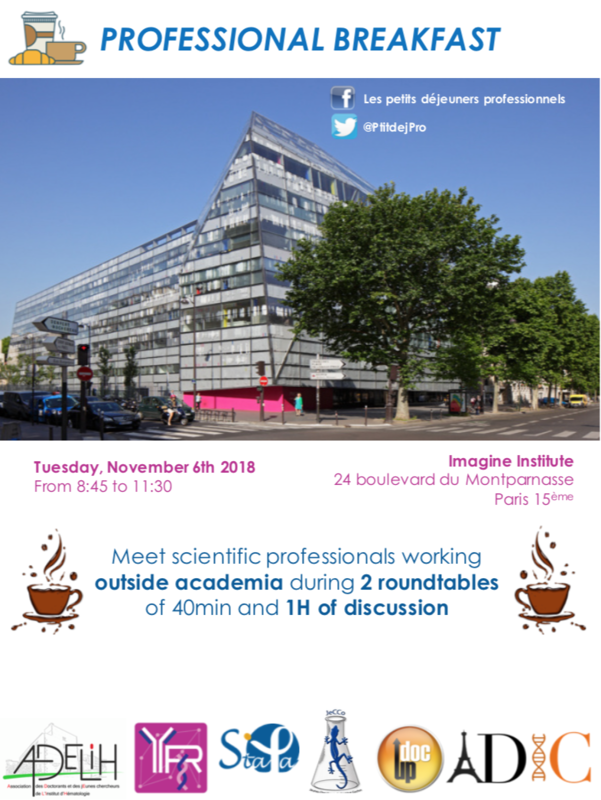 In the meanwhile Thomas has co-founded La Paillasse, the first french and world largest community lab that fosters open science and technology. Finally Thomas has recently co-founded Just one Giant Lab (JoGL), the first research and innovation laboratory operating as a distributed, open and massive mobilisation platform. 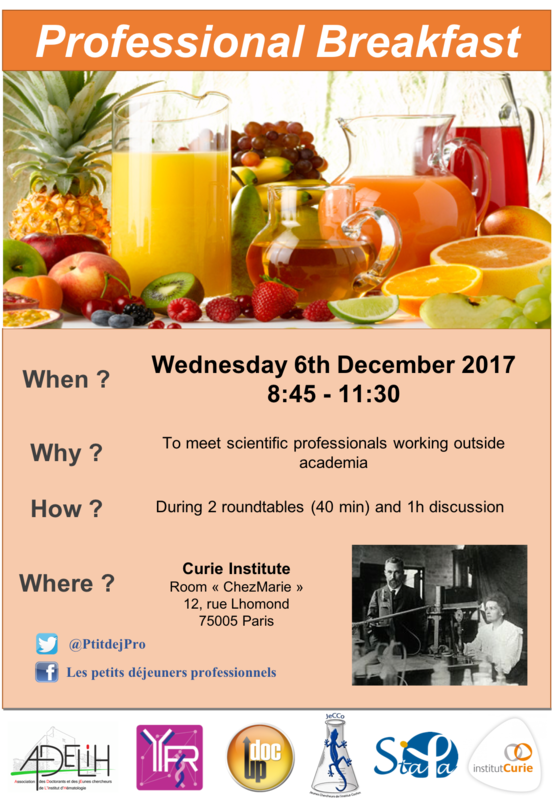 Lory Montout: Lory did all his studies in the field of bio-informatics and his PhD in structural biology at University of Paris Diderot. Since 2016, he is a consultant for the European Commission in Data science applied to Biology. Beside his consulting, he has also co-founded the company AZGUARD Cybersecurity & intelligence. He is now working as a free-lance data scientist, innovation director, and project manager and is directing Happy Dev, a network of self-employed workers. Pierre Bauër: After graduating from the engineering school Ecole Normale Supérieure, Pierre did a PhD in the field of physics and biology at Pierre and Marie Curie University and in parallel a master of business administration (MBA) at « Collège des Ingenieurs ». Now, he is a project leader at the Curie Institute and a consultant in free-lance. He is also a member-expert in PhD consulting EU, which is a consulting firm specialized in the interface between industry and academic research. Jennifer Sengenès Pascal: Jennifer completed studies in chemistry and a PhD in Molecular Biology at Pierre and Marie Curie University. After a first experience as a consultant in innovation financing, she did a master’s degree in Management of Technology and Innovation at Paris Dauphine University. Jennifer then joined DiamLite, when it was created, a company which develops fluorescent nanodiamonds used in bioimaging. Since 2014, she is project manager at PEP-Therapy, a start-up developing therapeutic peptides for cancer treatment. Nicolas DOULET is Industrial Partnership Manager at Imagine Institute. He did his PhD in Paris at Cochin institute and then obtained a master degree in business. Then he used to work as a scientific officer in France Biotech and Orphanet. Now his work consist in promote fundamental scientific project of Imagine’s researchers to potential industrial partner. Meena Murma is a Clinical Research associate. She did her PhD in Germany in Neurosciences, then she worked as a post doctoral fellow for 8 years at l’INAF, l’ENS and then l’INRA. She obtained her clinical research diploma at the Leonard de Vinci Institute and worked as a CRA at Necker Hospital. Marion PILORGE is Business Developer at Imagine Institute. After a PhD in neurosciences and genetics, she obtained a master degree in management and worked during more than 2 years in Alcimed as a healthcare consultant before working in industrial partnership area. Nouara LHOCINE is Grant Officer at Imagine Institute. She did her PhD in genetics in the Center of Molecular Genetics in Paris and worked as a postdoctoral fellow for 6 years at Pasteur institute and Imagine Institute. She is now working as a grant officer to promote fundamental scientific project with helping researchers. Aurélie LAUBIER is a DIM gene therapy project manager at Imagine Institute. She did her PhD in microbiology and immunology in Aix-Marseille CNRS lab. She did a master degree in management and innovation at ENS “Arts & Métiers” and worked during 2 years at Universal Biotech as health innovation project manager. She is now working for DIM gene therapy to promote fundamental project in this field. Alix Rousseau: After a PhD in Hematology and Oncology at the Saint-Louis Hospital during which she got involved in the ADELIH association, she then joined Inovarion where she exercises the post of Buisness Developer since October, 2017. Agathe Valluet-Paul: Strong of a double scientific (doctorate in oncology) and economic competence (specialized Master’s degree ESCP-EUROPE), Agathe is now Consultant at QuintilesIMS where she works on various consulting missions around the promotion of the medicine. 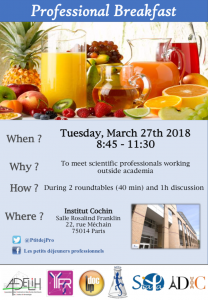 Romain Sikora: After his PhD in cellular biology and several years in different biomedical research institutes in Paris (Cochin and Curie), Romain has switched to clinical research and is now a Clinical Research Associate in oncology at Saint-Louis Hospital. 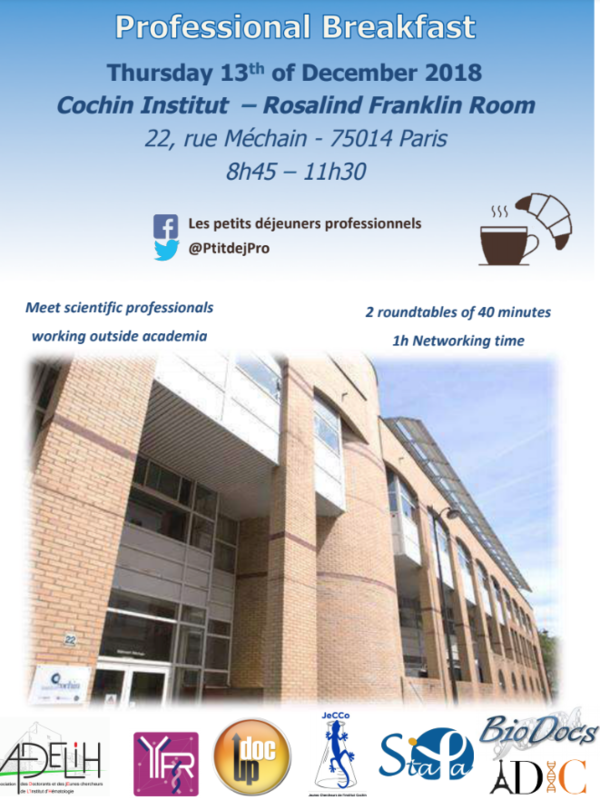 Mikhail Zaslavskiy: After a PhD at École des Mines of Paris in bioinformatics, he is now an Independent consultant in data science and bioinformatics and is also a study leader in the innovative start-up OWKIN specialized in machine learning applied to the medical research. 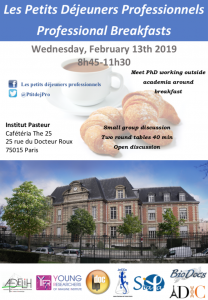 Marc Chevalier: Once Marc had obtained his PhD in Neuroscience, he decided to alternate between scientific positions and entrepreneurship while being involved in volunteer associations aiming at favouring communication between PhD Doctors and companies. He is now working as a Scientific Career Advisor at Institut Pasteur. Rémy Rodriguez: After a thesis on human genetic immunodeficiencies at the Imagine Institute, Rémy works today at Novoptim as a consultant. 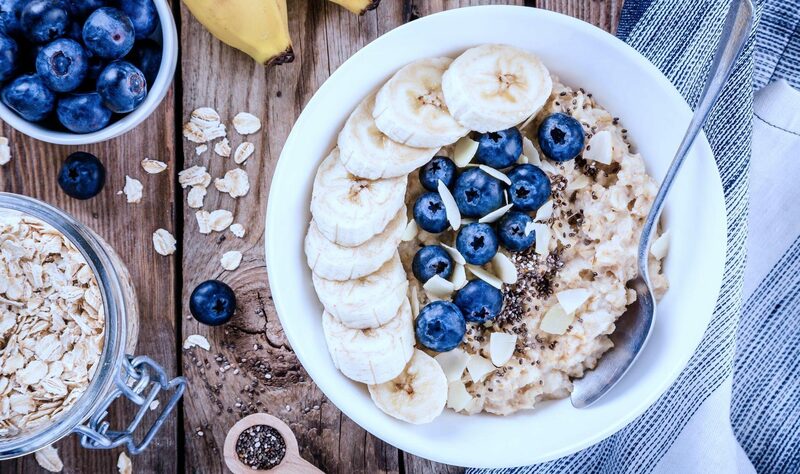 Its activity allows the companies to have a follow up in the field of health via, among other things, market analyzes or sales pilot setting up. Mathieu Ing: Directly after his PhD in Immunology realized at the Cordeliers Research Center (Paris), Mathieu Ing has been working since 2016 at DBV technologies as a researcher. He is in charge of research projects focusing on an epicutaneous immunotherapy that aims to deliver bioactive compounds to the immune system through intact skin. Bruno Latgé: Holder of an engineering master degree from AgroParisTech and specialized in Biotechnology, Bruno did a PhD in Molecular and Cell Biology at Institut Curie. In January 2017, he co-founded the Curie In’C2 initiative (an awareness-raising initiative about technology transfer). He is now Business Developer at FINDMED, a Consortium to coordinate new R&D partnership contracts between French SMEs from the pharmaceutical industry and the Carnot institutes. Isabelle Motta: Sorry, Isabelle will not be able to attend the professional breakfast. We are trying to find a replacement for her. Maureen Alivon: Maureen obtained her PhD in clinical pharmacology in 2014 in which she followed classes about clinical trials and project management. She then worked at Servier as a global communication project leader and quickly evolved as a global communication manager where she is responsible for the organization of scientific events, international collaborations and post-marketing studies. Emmanuel Pasco-Viel is Project Manager at the French Ministry for Higher Education and Research. Emmanuel did is PhD at the IGFL in Lyon, and then obtained a Masters degree in Research Administration. He is now in charge of several projects linked to the European Research Area (ERA). Jérémy Scelle is Consultant in Innovation financing at F. Iniciativas, a company aiming to promote both research and innovation, and to create bonds between public and private research. He obtained a Masters degree and a PhD in Molecular Chemistry at the UPMC, and works at F. Iniciativas since 2017. 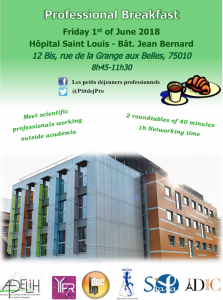 Amelie Dublineau will start a position of project coordinator at Institute Pasteur in mid-february 2018. She is in charge of an epidemiological study on Hepatitis C Virus in Egypt, thus her work will be based in Paris with missions in Cairo. After her PhD in Virology at the Pasteur Institute, she followed a training to become Clinical Research Associate and has worked on several studies in France as well as in Guinea and Malawi. 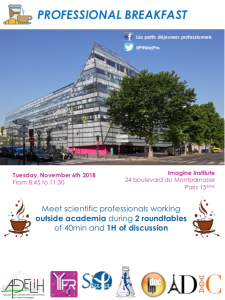 Elodie Touzé is a scientific mediator at Palais de la découverte where she participates in creating and animating conferences for general public as well as experimental workshops. After defending her PhD in Life Science 2007 in Strasbourg, she worked for several associations of scientific mediation oriented either more on theatre for kids or on experimental side. She also worked at Cité des enfants in Paris. Alexey Rak is Head of Biostructure and Biophysics at Sanofi. He is a scientist with extensive industrial and academic experience. Before coming to Sanofi he was a principal investigator at Max Planck Institute of Molecular Physiology in Dortmund, Germany. After a PhD in pharmaco-oncology obtained in 2012 in Paris Descartes university, Amelie became a scientific writer for Kephren. She then followed a training of clinical research associate and became the regional responsible for Hospira. She finally obtained a medical science liaison job at Jazz Pharmaceuticals where she currently works. Mark Livingstone obtained his Ph.D. in Biochemistry in 2011 and completed it with a MBA at HEC. He reached an extensive international experience at the interface between academic research and the commercialization of scientific discoveries. He is currently Director, European Accounts at Scientist.com, a business which builds private marketplaces that simplify the purchase of research services. After he got phd in genetics at Paris Descartes University in 2006, during one year Laurent studied strategical management at HEC. After that he joined OTC Asset Management as a charge d’affaires before he founded SPRING Invest, an investment fund in retail, in 2015. After obtaining her PhD at the CEA, Morgane followed an alternating training with Ozyme and UPMC in Health Marketing and a Master 2 in Sales Negotiations at UPMC. She then worked for 3 years as a sales engineer at Life Technologies and then became “Key Account Manager – consumables” at Thermo Fisher Scientific. Thomas Ybert is the CEO and co-founder of DNA Script. He holds an engineering degree and a PhD from Ecole Polytechnique. Thomas spent 3 years in the biotechnology department at Sanofi R&D, where he developed a biotherapeutic production platform based on yeast technology. After 2 years spent in San Francisco Thomas came back to France to found DNA Script.